When you first enter an ancient history or archaeology degree you are introduced to several sets of material evidence. Notably, the archaeology, material evidence, and philological evidence. But the philological side is more often than not rarely mentioned again. This is quite a shame considering some of the most interesting and revealing information comes from the ancient written sources. People generally fall into the trap of ignoring the writing in favour of the archaeology and artefacts and frankly you can’t really blame them because humans are naturally attracted to pretty visual things. I see this every day with the likes and shares on my Facebook page. But philology is all important too and if students can learn even a little about ancient writing and textual criticism, a whole new side to history and analysis opens up to them as it should. Philology is derived from the Greek terms φίλος (love) and λόγος (word, reason) and literally means a ‘love of words’. It is the study of language in literary sources and is a combination of literary studies, history and linguistics. Philology is generally associated with Greek and Classical Latin, in which it is termed philologia. The study of philology originated in European Renaissance Humanism in regards to Classical Philology but this has since been combined to include in its definition the study of both European and non-European languages. The idea of philology has been carried through the Greek and Latin literature into the English language around the sixteenth century through the French term philologie meaning also a ‘love of literature’ from the same word roots. Generally philology has a focus on historical development. It helps establish the authenticity of literary texts and their original form and with this the determination of their meaning. It is a branch of knowledge that deals with the structure, historical development and relationships of a language or languages. This makes it all the more significant to study as language is one of the main building blocks of civilisation. Comparative philology is a branch of philology which analyses the relationship or correspondences between languages. For instance, the commonalities between Latin and Etruscan or further flung languages of Asian or African provinces. It uses pre-determined techniques to discover whether languages hold common ancestors or influences. It uses comparison of grammar and spelling which was first deemed useful in the 19th century and has developed ever since. The study of comparative philology was originally defined by Sir William Jones‘ discovery in 1786 that Sanskrit was related to Greek and German as well as Latin. Cognitive philology studies written and oral texts in consideration of the human mental processes. It uses science to compare the results of research using psychological and artificial systems. 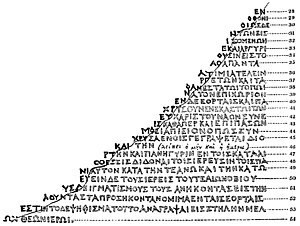 Decipherment is another branch of philology which looks at resurrecting dead languages and previously unread texts such as done and achieved by Jean-Francois Champollion in the decipherment of Hieroglyphs with the use of the Rosetta Stone. And more recently by Michael Ventris in the decipherment of Linear B. Decipherment would be key to the understanding of still little understood languages such as Linear A. Decipherment uses known languages, grammatical tools and vocabulary to find and apply comparisons within an unread text. By doing so more of the text can be read gradually as similarities and grammatical forms become better understood. The remaining text can then be filled in through further comparison, analysis, and elimination of incorrect solutions. Textual philology editing is yet another branch of philology with includes the study of texts and their history in a sense including textual criticism. This branch was created in relation to the long traditions of Biblical studies; in particular with the variations of manuscripts. It looks at the authorship, date and provenance of the text to place it in its historical context and to produce ‘critical editions’ of the texts. The importance of philology is exhibited in its use and achievements. Without philology the bible translation would be even more wrong, trust me read it in the original Greek. We would not be able to translate hieroglyphs, Linear B, Linear A, Sanskrit, any ancient language. Our entire written past would be blank, we would not have the information we have now on mathematics, social structure, philosophy, science, medicine, civilisation, transport, engineering, marketing, accounting, well anything really, knowledge would not have been rediscovered or passed on without the ability to study texts and language. Understand the love of words. This entry was posted in Language and tagged Alice Kober, Ancient Greek, Ancient Languages, Biblical Studies, Byzantine Empire, Christian Papyri, Christianity, Classics, Egyptian, Egyptian hieroglyphs, English language, Genesis, Greece, Greek, Greek Alphabet, Greek language, Hieroglyphs, History, Jean-François Champollion, Language, Languages of Europe, Latin, Linear B, Magic, Medicine, Michael Ventris, Philology, Research, Roman, Roman Empire, Rosetta Stone, Sanskrit, science, Strange Texts, theology, Translation, travel, William Jones. Important Rules to Remember When Learning Ancient Greek Part 3! Well followers, with the success of parts one and two of my Important Rules Series I give you part three! This entry was posted in Language and tagged Active voice, Ancient Greek, Antecedent (grammar), Christian Papyri, Classics, Declension, English language, Genesis, Grammatical person, Greece, Greek, Intensive pronoun, Linguistics, Natural, new testament greek, Nominative case, Object (grammar), person pronouns, personal pronouns, Plural, Pronoun, Religion, Roman, Social Sciences, Subject complement, theology, Translation, Verb, vocative case.